With 85-pound, sable-red German shepherd, Kody, attached firmly to the other end of the jute toy in his hand, Garden Grove Police Department Cpl. John Bankson finally has found his match. 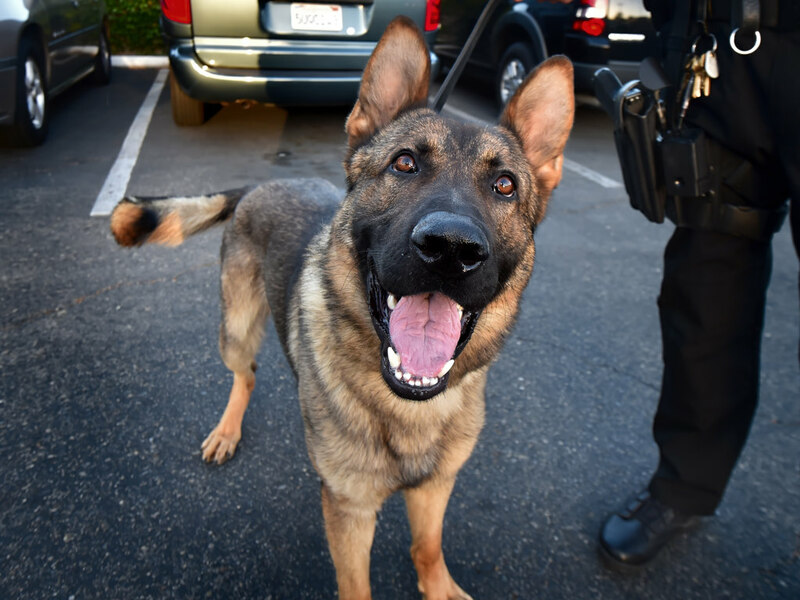 Since joining the GGPD K9 unit three years ago, Bankson has worked with a series of dogs that for one reason or another haven’t worked out. “You hit these milestones that I haven’t been really able to reach with the dogs,” he said on a recent evening, as he and 19-month-old Kody were about to begin their shift. Kody came home with Bankson in February and after five weeks of training, started working patrol. Bankson is “cautiously optimistic” Kody is here to stay. When Bankson started with the unit in July 2015, he inherited Belgian Malinois, Strauss, from another K9 officer who left the unit. “He had some struggles that we couldn’t train out of,” said Bankson. After nine months, Strauss went into early retirement. He was adopted out to a good home. In July 2016, Bankson partnered with 19-month-old German shepherd, Rex. Rex developed some bad behaviors and after about a year had to be sent back for more training. He’s now working for the Colton Police Department. “Glad he’s working, still doing his thing,” Bankson said. GARDEN GROVE PD Cpl. John Bankson with his new K-9 partner, Kody, an 18-month-old German Shepherd. (Photo by Steven Georges/Behind the Badge OC). There also was 13-month-old Doc, a male German shepherd who didn’t make it past the training because of a medical condition. He ended up being diagnosed and treated, and now is healthy. He will be going to a new agency in a few months. “At least all the dogs that I’ve dealt with are good,” Bankson said, noting that they are all healthy and either retired or working elsewhere. Plus, Bankson is incredibly well trained because with each new dog, he returned for five weeks of training. And now he has Kody. The K9 facility brought several German shepherds for Bankson and another officer from another agency to pick from. The other officer had first pick. Bankson had his eye on Kody. Fortunately, the other officer picked another dog. “Part of it was his puppy enthusiasm … he was very social,” Bankson said. On this evening, Kody was in full puppy mode, running back and forth, leaning against anyone he could to steal a few pets, and playing with his favorite toy. But at Bankson’s command, Kody immediately responded. “He’s very obedient,” Bankson said. 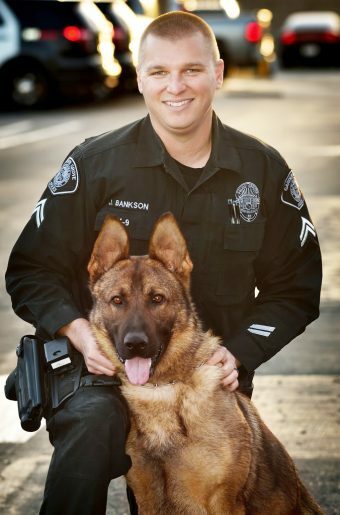 At Bankson’s say, Kody entered the rear of the police unit and stayed – with the door open. “This is far beyond what I’ve had with [the] other two dogs,” he said. Even while he retained his cautious optimism, he pulled up a photo on his phone of his family with Kody. He admitted that when he took that photo, he knew it would work. Part of that feeling also comes from the confidence he has that Kody will do what he says. “It also allows me to do my job better,” Bankson said. For more on law enforcement issues and personalities, go to www.behindthebadgeoc.com.